The middle-class producers of culture and ideology often see themselves as the Left. My texts have often been perceived as attacks on the Left. But I support key policies of the Left. In many areas, Aborigines can agree with the Left, including the people who have felt most hit by my criticism. I agree with them on land rights and conservation, trade unions, redistribution and the role of government in guaranteeing equitable health care and education. The contention of mine that has caused most consternation when I have challenged the Left during the past eight years is that the result of progressive policies can be at odds with the good intentions that inspired them. My aim has been, as Dennis Glover wrote in The Australian yesterday, to "set higher standards for the Left" by critically examining the outcomes of ostensibly leftist policies. It is appropriate to set high standards because the Left's claim to the right to govern rests on its promise to lift the living standard and prospects of the lowest classes. The challenge of education facing our children should be understood as a class challenge. There are strong class forces at work that are barriers to social advancement. The main means by which class stratification is maintained and social progress impeded is not by direct and conscious oppressive behaviour by privileged classes. Rather, the forces of class operate culturally. They are embedded in the prevailing ideologies and intellectual currents, popular and niche cultures. Their effect is to cause confusion in the minds of lower-class people about social progress and how it may be achieved, and cause them to behave in ways that are contrary to their interests. * They say substance abuse is a health issue and should be approached with tolerance. We say it is a behavioural and social order issue and we need to rebuild intolerance. * They say education should be culturally appropriate. We say this should not be an alibi for anti-intellectualism, romantic indigenism and a justification for substandard achievement. * They say we should respect Aboriginal English as a real language. We say we should speak our traditional languages and the Queen's English fluently. * They say our people need to bedefended in a hostile criminal justice system. We say we need more policing to restore law and order. * They say our people are victims and must not be blamed. We say our people are victimised but we are not victims. * They say we have a right to passive welfare. We say we do not have a right to dependency and, indeed, we have a greater right to take up a fair place in the real economy. * They say economic integration is antithetical to our identity. We say our culture cannot and will not survive as long as we live in the social dysfunction caused by economic dependency. * They say poverty is our main problem. We say passivity is our main problem because it prevents us from taking advantage of opportunities to get out of poverty and the resources we get are squandered. The striking thing about this stark disagreement about what is really progressive is that we are at odds with so-called progressive thinking across vast tracts of policy. For me it is not personal antagonism that explains the gulf between me and most national indigenous leaders and intelligentsia; it is this fundamental analytical and policy gulf about what is progress and what is not. Glover is right when he says that I am a man of the Left because my fidelity is to the lot of the underclass, of whom my people are its most miserable members. It is that I believe liberal and conservative policies have more to contribute to indigenous uplift than outdated progressive thinking. It became clear to me that some elements of leftist ideology contribute to the barriers that keep our people down. The key to understanding this is to recognise the profound change in the role of leftist theory. When the theories of the Left were originally formulated, the Left was a revolutionary force. However, the Left has merged with power and government. Leftist ideology is integral to the political and intellectual structure of our society. The challenge for the Left today is to stop assuming that leftist policy by definition is policy that will help the most oppressed. The most obvious example that this is not the case is the rise of a political and intellectual industry that explains, defends and facilitates behaviours that keep people in the underclass. A young Aborigine today who follows the conventional leftist recipes of the past four decades is destined to stay at the bottom of society. To promote more thoughtful discussion about computers and learning, and to provide some background before considering Squeak projects, this chapter will begin with general thoughts about children and computers. Part 1 presents some assumptions and persistent misconceptions about computers and learning. Part 2 presents their most common current use, simulating older media—such as words on paper or musical sound—while offering extra leverage for working in those media. What if mathematicians had a place to keep all their living objects? Not a planar place, but a multidimensional one, with an unlimited capacity to hold things inside. A space with colors and movement. The purpose of this chapter is to update the paper “Back to the Future – The Story of Squeak, a Practical Smalltalk Written in Itself” (hereinafter simply “BTF”). This chapter will explain the design and operation of the Squeak Object Engine. The term Object Engine is a useful phrase that encompasses both the Smalltalk low-level system code (such as the Context and Process classes) and the Virtual Machine. We will discuss what a Virtual Machine (VM) is, how it works, what it does for Squeak programmers and users, and how the Squeak VM might develop in the future. If ever there was a topic to which Nietzsche’s thought could be applied, it is Squeak. We have not yet learned the nature of the destiny of Squeak because it continues to unfold before our very eyes and because we are about the business of creating that destiny. Yet, to an extent not attained by other programming languages and environments, Squeak has always been about the future. Its future has in fact determined many of the ways it works and thinks today. The XP practices embody a set of heuristics for recognizing and adapting to change, for change is the only constant in XP. The XP process values learning as a basic skill for individuals and the team, as the tensions inherent in development stimulate evolutionary growth. In the XP view, setbacks and failures provide essential feedback on which the software development process thrives, where risk is something to be understood and managed, not merely avoided. This document is a first draft of a summary of Etoys on the One Laptop Per Child XO computer. It will undergo many changes in the next few months. The first official edition is expected by August 2007. “Like-Hypercard”: WYSIWYG Page oriented UI & Media authoring for presentations, web content, etc. 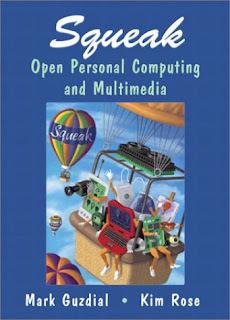 “Like Squeak Smalltalk”: Everything is a dynamic object, multimedia, multiplatform, etc. “Like Logo” – but with costumes, multimedia, etc. Etoys was first tested with children in 1997, and has since spread around the world to be used by many children in cultural and language environments. Etoys is multilingual and has been successfully used in USA, Europe, South America, Japan, Korea, India, Nepal, and elsewhere. The multilingualization is dynamic: languages can be switched on the fly (this can be lluminating for children) and there is a “kit” that aids the introduction of a new language. 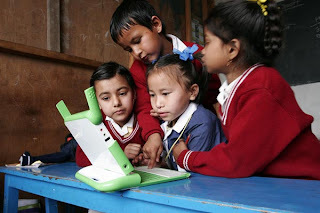 Etoys is also “ecumenical”: it runs on more than 20 platforms bitidentically including all of the standard ones, many PDAs and SmartPhones, and on the OLPC XO machine. It's better that everyone has their own interactive medium and chaos reigns, than the alternative of Big Media or traditional School alone. If we want radical change in the media and education then there is no alternative but to go through chaos. “Web 2.0” won't change School dramatically if it doesn't also change society dramatically. We don't have to use the phrase “web 2.0”; the read write web is a satisfactory, albeit less hip alternative. The social optimists' hope for web 2.0 is that it is disruptive and corrosive to the hierarchical way of doing things, enabling the active participation and empowerment of those formerly known as the audience. The pessimistic or realistic problem with web 2.0 is its tendency to overreach itself and the inevitable fact that as it grows (a new blog every second), the quality must decline. My own blog was initially more intended as an easily searchable online notebook than anything else. I was initially surprised at the number of other people who read it and it took me a while to take the conversational aspect of it seriously. I've learnt a lot from some other bloggers (eg. artichoke) in the way they nurtured their comment threads – and eventually through thoughtful comments received on my own blog. One possible downside to being noticed is that I might end up wanting to please those readers rather than representing my own thoughts (self censorship). The upside is that knowing there are readers persuades me to express my thoughts more clearly, partly for the readers' sake, but that is a huge benefit for me as well. There is positive pressure to make your thoughts clearer for a real audience, especially a critical audience who can respond. But not all blogs or discussion groups are like this. Web 2.0 can also be a game that people learn to play in an attention seeking economy. Global village idiocy, banalisation, hive mind, self censorship and chasing popularity are all real problems. I also need time alone to read books, for slow, deep thinking, for reflection, to get away from the business and shallowness of much of the web. Now I think it's more about exploring meanings, I never thought that meaning was so complicated but blogging has gradually changed me. If there is a real struggle to express ourselves more expertly through language then that recreates who we are. However, the notion of using “web2.0″ tools to expand expertise (certainly possible) is different from the notion of bloggers already being experts. The internet has certainly blurred the lines between expert and amateur. But as well as some amateurs displaying expert knowledge there are also lots of amateurs pretending to be experts when they are not. For me the important question is not web 2.0 as such but how do we work out who an expert is? Expertise is special IMO and ought to be valued. I’m critical of theories that just emphasise the importance of connection without saying much else. Paul Graham makes a point about Democracy. Amateurs can sometimes surpass professionals (wikipedia) and deciding what counts for news (reddit, delicious). Unlike blogs, the sites mentioned here have quality control mechanisms. Collectively, the blogosphere is doing the filtering for us. But of course these sites are still evolving, they have not solved the issue of expertise. Computers and the internet do have a disruptive effect on School, Media and many of our ideas, including our idea of expertise. I think it is the disruptive potential that makes the system and some teachers (many follow the lead of the system) hesitant. The bible writing monks were experts at all things involved in being a bible writing monk. But that didn’t make them experts in all things involving printing. I wonder how many made the transition? So what is our notion of expertise? How do we recognise a powerful idea, how do we recognise an expert? For me, this is the question that the “web 2.0” movement needs to answer. The title includes a reference to Tom Friedman's well known book, The World is Flat. Thanks to durff for the insight that it is also wrinkled. There is a great discussion, towards the end of this debate, about the nature of expertise. I liked Andrew Keen's approach about the historical importance of the nation state, democracy and authority, that it is a debate that we have to have, although I thought that the audience did very well in challenging Keen (eg. the guy from Canada, the guy from wikipedia), perhaps more so than David Weibberger did. I'm having a look a Smalltalk / Squeak programming. It's promoted as object oriented (OOP) in a pure form, so my intuition is that if I can grok Smalltalk then that will deepen my understanding of OOP and how it is really meant to work. All computation is triggered through message sends. You send a message to an object, and something happens. Almost all executable Smalltalk expressions are of the form <receiverobject> <message>. Messages trigger methods where the mapping of message-to-methods is determined by the receiving object. Methods are the units of Smalltalk code. Kay has repeatedly expressed his regret that he chose the term “object-oriented” instead of the more relational concept of “message-oriented.” What is important about biological cells in Kay’s systems theory rendering of them isn’t what they’re made of, but rather their modes of interacting. This first one is from Stephane Ducasse's book on learning squeak through programming robots and the others are from Mark Guzdial's book cited above. Comments are in "quotes". | pica | "local variable declared"
pica := Bot new. "The new message is sent to the Bot class to create a new robot and associate with it the name pica (:= is for assignment)"
pica go: 100 "the colon (:) after go means that an argument is required. go: 100 is a message send to the robot object pica, which can also be described as the message receiver"
1 to: 10 do:  is a message send to the object 1! The message to: do: is a message understood by the Integer class! 10 and the block of code (statements contained in square brackets) following do: are actually arguments in the message. anArray := Array new: 10. "create a new array with 10 places"
| aValue | "declare a variable"
Everything is an object. This rule does not actually mean "Set the value of 'aValue' to integer 2" but instead means "Set the variable aValue to point to an SmallInteger object whose value is 2." 1 to: 10 do: [:index | anArray at: index put: aValue*index ]. This has given me some understanding of how messages are both important and different in Smalltalk. Web 2.0 has become the new conventional wisdom of those who see themselves as radical reformers of the education system. Flashing bells and lights, gee wizz. Web 2.0 dominates educational technology conferences just like logo used to dominate educational conferences (without being deeply understood) in the late 80s, early 90s. This is a new majority within a minority. Let's sit around and self righteously criticise other educators because we get it and they don't. It's a double edged sword. We have enhanced powers of connection and collaboration, many wonderful new applications but also some are thinking that enhanced ability of connection is some sort of virtue in itself. Like spam. It's not. Connection without discernment leads to trivia. The 1000 monkeys hammering on the typewriter is a real part of web 2.0. In some ways Web 2.0 is like TV, mainly crap, with the occasional good programme. Yes, web 2.0 is interactive, I know, but that creates new problems as well as new opportunities. Web 2.0 bloggers sounding off about how information has changed but then running for cover when asked to deepen their analysis (how has information changed?). 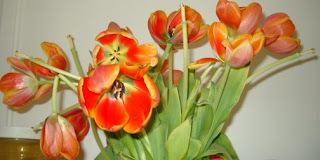 What is the point of blogging if you are not prepared to deepen? No historical awareness of some of the great educational software (eg. Smalltalk / Squeak / Etoys, logo, *logo (pronounced star logo) and hypercard) and educational theorists (eg. Papert, Harvey, Kay) that have been around for years. Some prominent thinkers have pointed out that we could have had a better web, a network of message passing objects. Ted Nelson. Alan Kay. There are software issues as well as cultural issues to be explored here. This was on ABC TV (Monday 16th July) last night and will be repeated today (Tuesday) at 11:35 am. Also, the full program will be online from today. 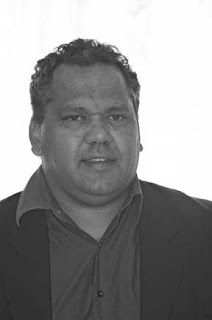 It puts a compelling case for the urgent need to end passive welfare dependency for indigenous Australians, which in some cases transforms itself into 4 day long grog fuelled parties, violence, child abuse and perpetuates dislocation from the real economy. This has been going on for years. 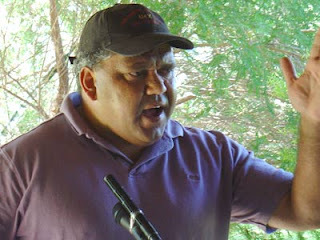 Noel Pearson emerges as a troubled, gutsy leader who as well as thinking through the blueprint for welfare reform has to deliver the bad news to his home town (HopeVale, 50km north of Cairns). He reflects on the personal angst this has caused him. I've put up some notes, on the learningEvolves wiki, in preparation for CEGSA (Computer Education Group of South Australia) conference presentations, next week, about the One Laptop per Child and Alan Kay. CEGSA programme, abstracts. 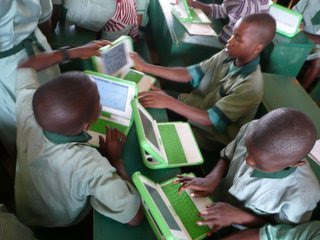 The One Laptop Per Child project plans to release millions of cheap laptops to developing countries over the next few years. 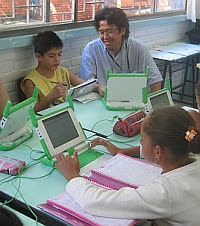 This presentation will discuss the hardware, software and educational goals of the OLPC Project. Alan Kay, winner of the 2004 Turing award, invented the first object orientated programming language, Smalltalk. His educational vision, developed over 30 years, has not received as much attention but is just as interesting. This presentation will describe that vision. I've been away for 12 days, in hospital having my kidney tumour (and left kidney) removed. The first 3 days were to restore my blood to normal, since I was on blood thinners for an earlier pulmonary embolism (blood clots in pulmonary artery). This require a heparin drip, since heparin blood thinning is reversible within a few hours. I had my operation on Tuesday 3rd July. I was unconscious from 8:30am to 3pm. The surgeons told me that it was a very successful laproscopic (keyhole) procedure. Nevertheless, you do wake up at the end of it in a lot of pain and feeling very groggy from the anaesthetic. There were some minor complications (mysterious heart pain for a couple of days) but new tests indicated there was nothing wrong and the pain eventually disappeared. The kidney biopsy showed that the tumour was non malignant!! A Renal Oncocytoma!! This, of course is good news, I don't have cancer. Also fortunately, I was prepared for this possibility psychologically (kidney tumours are a catch 22 situation) and further research shows that it seems to be best for this tumour to be removed anyway. I still need more time to achieve a full recovery but certainly my prognosis is excellent.